Why do we study image processing? Image creation: generation of digital images and their resulting properties. Image modification: operations that can be performed on digital images including denoising, enhancement, and compression. Image analysis: techniques for extraction of biomedical data from images, including feature recognition. 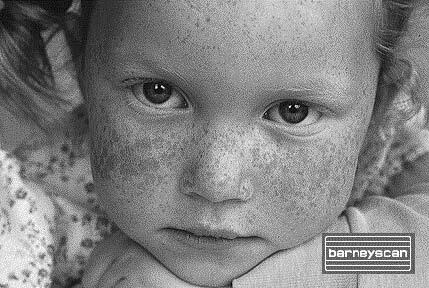 The issues and techniques discussed here are general: they apply to images acquired using various methodologies, including X-ray radiography, X-ray computed tomography, MRI, ultrasound, and PET. Note that while image processing can be performed on analog images (e.g., by way of optical Fourier techniques), this overview concentrates on the processing of digital biomedical images. Analog images, having continuously varying color or gray-scale representations, can be stored as digital images for use in computer-based systems. The rules that apply to the digitization of one-dimensional (1D) signals (e.g., voltage versus time) also apply to the digitization of spatial images (e.g., gray level versus position): the images must be sampled and quantized with enough fidelity that they truly represent their analog image counterparts. This, of course, depends on the application for which the images will be utilized. Scanning, the initial step in the image digitization process, includes the division of the picture into a number of small regions called picture elements, or pixels (see Figure 1). The scanning operation represents the image by a grid consisting of m rows × n columns. For example, in the image shown in Figure 1, m = 288 and n = 432, for a total of 124,416 pixels. Each pixel is addressed by its (m,n) coordinate within the matrix. The scanning operation is accompanied by a sampling operation, which transforms the representative brightness of each pixel into an analog voltage level or other measurable signal. In the case of an X-ray radiograph, this operation might be performed by a photomultiplier tube. A good example of a common line scan sensor is a flatbed scanner, which uses an array of discrete silicon imaging elements, called photosites, to produce voltage output signals that are proportional to the intensity of the incoming light at each linear location. These solid state devices can be shuttered at high speeds (e.g., 1/10,000 of a second), and their precision typically ranges from 256 to 4096 elements [Gonzalez]. Solid state area sensors also exist, containing grid sizes from 32 × 32 pixels up to 1280 × 1024 pixels. Figure 1. Eight-bit, gray-scale digital image consisting of individual square pixels, or picture elements. As illustrated in Figure 2, two-dimensional (2D) spatial images must obey sampling constraints that are similar to those imposed on 1D, time-based signals. When 1D signals are digitized with an analog-to-digital (A/D) converter, they must be sampled at a frequency greater than or equal to twice the highest frequency component in the signal. Likewise, 2D images must be sampled at a spatial frequency greater than or equal to twice the highest spatial frequency component in the image. Otherwise, these undersampled images will display the type of aliasing depicted in Figure 2. Note that to redisplay a digitally stored image, a D/A conversion is often required (e.g., for a cathode ray tube in a television set). Figure 2. Simple illustration of aliasing in a digital image line [after Seeram, p. 55]. Some images are not produced on native rectangular grids. 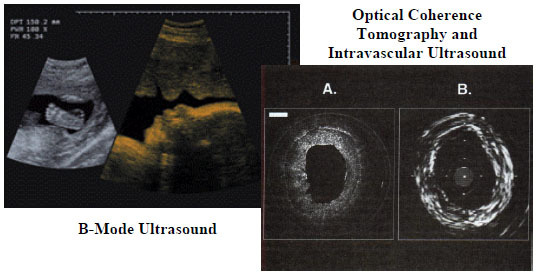 B-mode ultrasound images, for example, are often reconstructed from fan-shaped beams or radially-distributed ultrasonic reflectance data (see Figure 3). Production of a 2D image requires that these radial line data be interpolated. These interpolation schemes can affect the quality of the overall images, especially if the individual line scans are separated by large angles. Volume 1, Academic Press, San Diego, ©1982, ISBN0-12-597301-2. Volume 2, Academic Press, San Diego, ©1982, ISBN 0-12-597301-2. Wesley, Reading, MA, ©1993, ISBN 0-201-50803-6.